When a mysterious package is delivered to 470 Scenicview Drive, spring break 2019 doesn’t stop for the house full of teens. It’s not until two of them discover that this package is not ordinary but extraordinary that things start getting a little unusual. Journey with Cirrus Circus as two friends romp through Medieval England, Golden Gate Park in the Summer of Love, a run-down speakeasy in the 1920s, and more! Energetic, playful and spirited, Decades is a captivating voyage of discovery that showcases a variety of acrobatics and circus arts in surprising twists and turns. The latest full-length performance from Cirrus Circus will feature original numbers on Unicycle, Tight Wire, Acrobatics, Duo Static Trapeze, Contortion, Juggling, Chinese Pole, Dance, Lyra and Cyr Wheel, Aerial Straps, Hoop Diving and Aerial Sling. Cirrus Circus is the teen performance troupe at the School of Acrobatics & New Circus Arts (SANCA). They are known throughout Seattle as one of the most accomplished youth circus groups in the region. The troupe is in demand locally, performing at many of Seattles popular festivals and events, including Moisture Festival, Seattle Centers Winterfest, the Georgetown Carnival, and more. In July 2014, Cirrus Circus had the honor of performing internationally at the London International Youth Circus Festival in England, at No Fit State in Cardiff, Wales and Island Circus in Sylt, Germany. Plunge into the depths of the underwater world with SANCA’s Professional Preparatory Program students as their one small submarine embarks on a circus exploration of the deep. Join the intrepid captain and crew as they encounter acrobatic fishy creatures, buoyant aerialists, danger, fear, joy and a little floundering along the way. Guaranteed to leave you drenched with laughter and a water-logged heart. Submerged will feature acrobatics, contortion, aerial fabric, rope, and hoop, as well as dance, juggling, and partner acrobatics. Take a deep breath and dive dive dive! Each year our Professional Preparatory Program students create a full length circus show as a capstone project for their nine-month intensive. The Professional Preparatory Program is a first step towards a career in circus with a specific focus to prepare graduates for further study at a multi-year circus institution for higher education. The curriculum is structured as a rigorous generalist program designed to provide strong foundations in five main areas of focus: Floor Acrobatics, Aerial Acrobatics, Dance, Theater, and Act Creation. The 9-month academic year is divided into five sessions, during which students will first learn a baseline of skills, learn to create acts in specialties of their choice, and, in the final session, participate in the creation and performance of this group show. Fun in the sun and good times to be had for all at Summer on the Cirque Riviera! Take a stroll through the Mercado del Mar. Catch some rays poolside with buff babes and saucy sailors, but beware of pool sharks! Or just relax and beat the heat with a glass of wine, or perhaps something stronger at Cirkuski Kafić where you may even catch a glimpse of the Green Fairy. Summer on the Cirque Rivera will keep you cool with daring feats of acrobatics, waltzing cyr wheel, trampoline, lyra, tightwire, aerial rope, and much more! SANCA’s staff works hard all year long, bringing you the joy of circus! Now let them share with you their love of performance as they twist, turn, tumble, and twirl their way through a day on the Cirque Rivera. Adults $20, youth 12 & under $12. Where do we drift off to when we sleep? 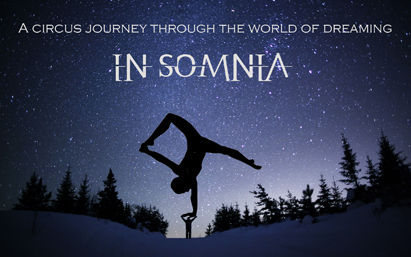 Leave the waking world with SANCA’s Professional Preparatory Program graduates as they entwine themselves in a dreamscape of aerials, acrobatics, handbalancing, dance, Chinese pole, and contortion. Fall into our circus dream and lose yourself in what you find there. The SANCA School of Flight is welcoming Fall with the Festival of Flight: Wtiches and Wizards! The Open House and Flying Trapeze Shows are a celebration for the whole community. First time flyers are encouraged to try flying on the trapeze during our Open House and to stay for the Flying Trapeze Shows that feature the School of Flight team flyers performing high-flying tricks and feats of derring-do! The flying trapeze will be open to participants throughout the Open House. Space is limited, one turn per person, $5. Participants must be 4 years old to fly. The SANCA School of Flight Open House is a celebration for the whole community! First time flyers are encouraged to try flying on the trapeze. The flying trapeze will be open to participants throughout the Open House. Space is limited, one turn per person. Participants must be 4 years old to fly. Turns on the flying trapeze are available for $5. Shows are non-ticketed events. Contributions are welcomed at the door.